Venezuela’s opposition renewed nationwide protests on Thursday to pressure President Nicolas Maduro to hold elections and improve a collapsing economy, and vowed to keep up pressure by staging three more protests in the next four days. 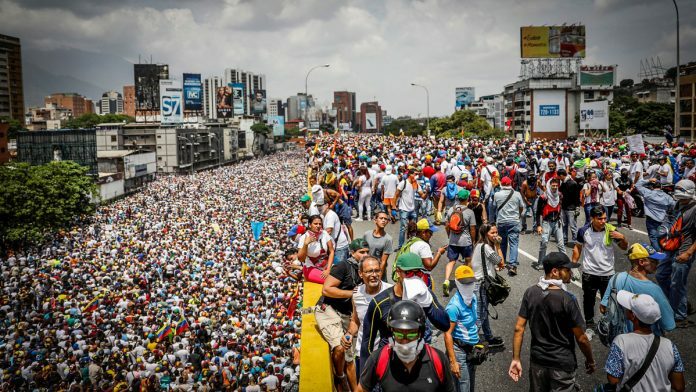 The opposition’s leadership then called for further protests in communities across Venezuela on Friday, a white-clad “silent” march in Caracas on Saturday to commemorate the eight people killed during unrest this month, and a nationwide “sit-in” blocking Venezuela’s main roads on Monday. “Immediately the global media and those irresponsible people, including that trash called Capriles, came out to accuse the government, the revolution, the army, the National Guard,” Maduro said, wearing a white doctor’s gown during a televised address meant to showcase Venezuela’s health system, which is in fact crumbling. Capriles responded on Twitter that Maduro, “like all dictators,” is a compulsive liar, and called on Venezuelans to keep up protests. Seeking to Keep up Pressure, Venezuela Opposition Plans More Protests, setting the the stage for prolonged disruption in volatile Venezuela.